from Alard Equipment Corporation on Vimeo. 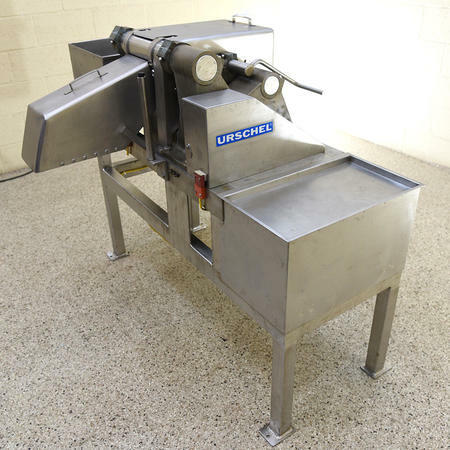 An Urschel model GRL french fry cutting machine, strip cutter, chip cutter, shown here in a video demonstration cutting flat slice crinkle cut french fry strips from white potatoes, russet potatoes and sweet potatoes. See VIDEO of this machine cutting KRINKLE CUT french fries here. 1.5 inch water inlet and discharge ports with sanitary Tri-clamp connections in a horizontal flow orientation. Manufacturer rated normal capacity of up to 36 gallons per minute though put (depending on product viscosity and head pressure) and 200 psi maximum pressure. 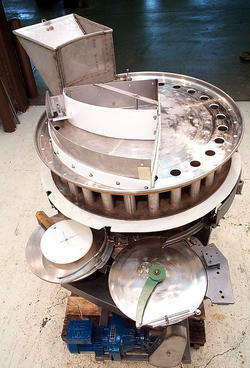 Jacketed head with 1/4 inch threaded ports for heating or cooling media, e.g. for water cooling. 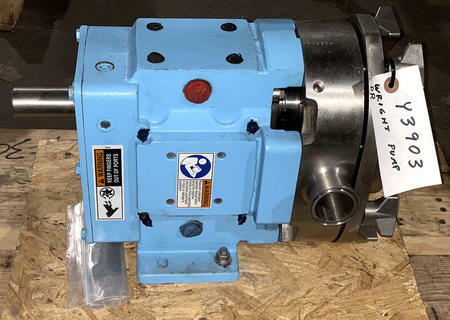 This PD pump in like new condition with no visible scoring, wear or pitting of the inside cover, impellers, or back plate, and has very close tolerances. 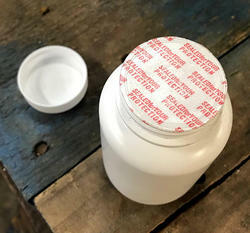 It's so new and tight, we recommend it for ambient or low temperature products, though presumably the jacketed head can be used to ameliorate the tendency for hot products to swell and bind the impellers. Currently configured for 356 RPM for a calculated output of approximately 21.9 gallons per minute. 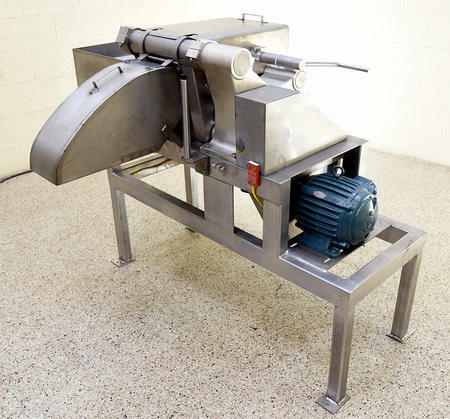 USDA / 3A sanitary food grade pump with a T316 stainless steel body, cover and shaft. Easily disassembled for cleaning & sanitation. Mounted on stainless steel base. New 1760 RPM motor, new gear reducer. As of this writing, this Waukesha 30 lobe pump is in stock at ALARD, in LIKEN NEW condition, available for immediate shipment. 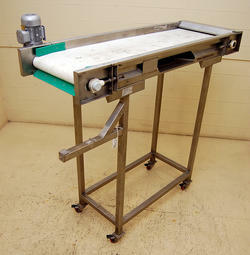 A 6 foot long by 15 inch wide rod belt Dunkley takeaway conveyor, previously used with a Dunkley Cherry pitter (available separately) to conveyor pitted cherries away from the pitting machine, with belt spacing to allow any loose pits to drop through. 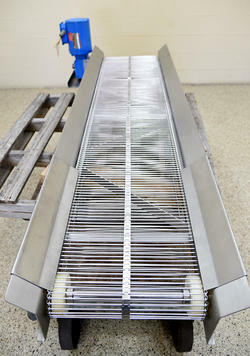 Ideal for it's original purpose, but could as well be used as a cleaning / grading conveyor (which would allow fines to drop through), a feed conveyor, takeaway conveyor, or transfer conveyor for a wide range of raw, peeled, or cut fruits and vegetbles, and/or packaged food products in a pre-cut produce packing or other industrial food manufacturing process environment. 72 inch long by 15 inch stainless steel rod belt, with 3/16 inch rods on spacings allowing for 3/8 inch openings. 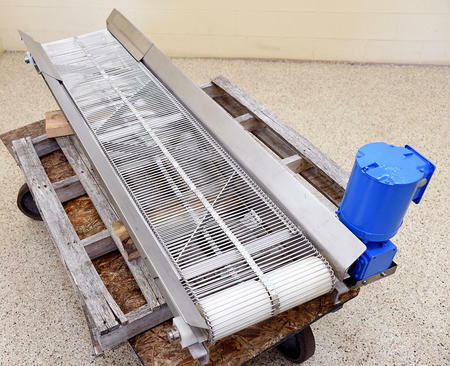 The conveyor did not / does not come with any bottom catch pan. 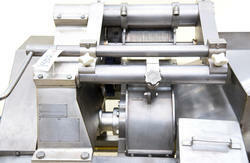 The belt runs between stainless steel sides that flare out to a width of 20.5 inches. 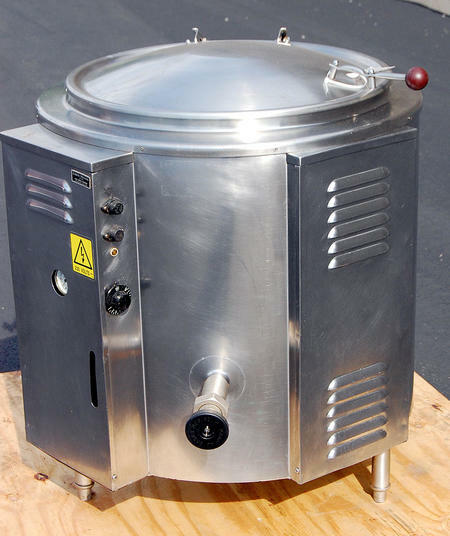 All food grade stainless steel construction, with corrosion resistant plastic bearing blocks, 4 inch diameter plastic belt pullies, and stainless steel shafts. 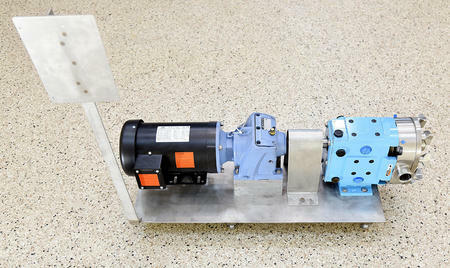 Fractional HP 208/230/460v 3 phase drive 1725 RPM drive with 50:1 gear reducer. Did not come with, does not include legs, but we can fabricate legs to buyer specification at extra charge. 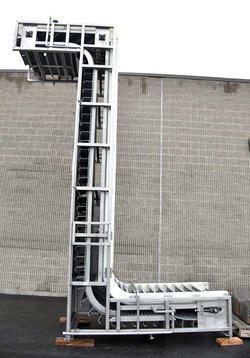 Can be configured as an elevating conveyor, horizontal conveyor, or lowerating conveyor, per customer requirement. CALL 315-589-4511 to discuss your bulk food product handling needs. 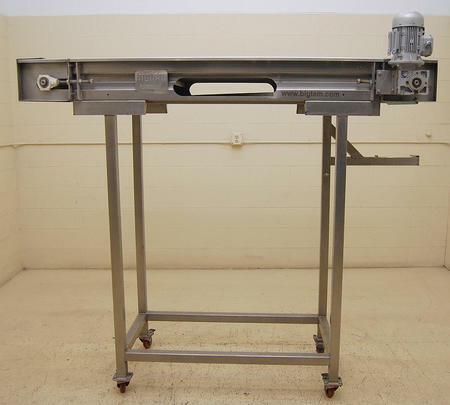 As of this writing, we have this stainless steel rod-belt conveyor in stock in EXCELLENT operational, mechanical and cosmetic condition, available for immediate shipment. 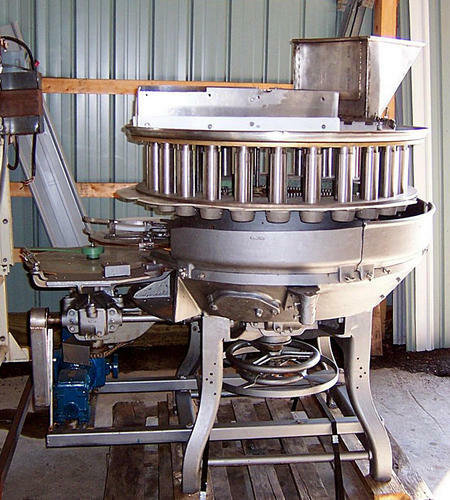 Also at the time this is written, we have multiple Dunkley cherry pitting machines and multiple Dunkley cherry-pitter takeaway conveyors; CALL 315-589-4511 to confirm availability, and to discuss your particular food equipment needs. 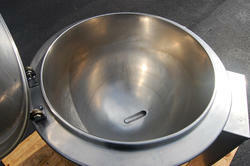 24 inch diameter by 20 inch deep hemispherical bottom vessel, with a 1.5 inch front bottom outlet and manual draw off valve. 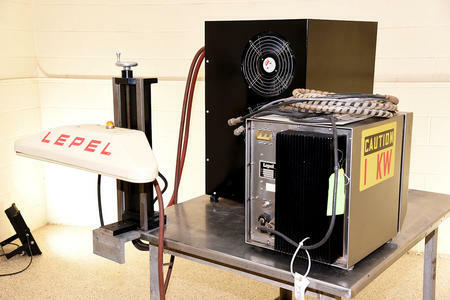 Steam jacket manufacturer tagged for 30 psi, "U" stamped and National Board coded, with self-contained / integral electric heater powered by 230 volt 3 phase electrical input, complete with precise thermostatic control. 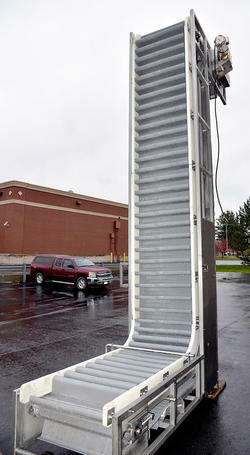 34 inch infeed height, 12 inch discharge height. 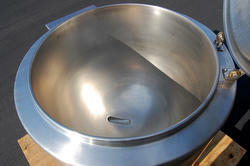 Energy SAVING hinged stainless steel top cover with lift handle. Tripod configured 6 inch high bullet feet. Shop tested and serviced with new pop-off & fill valves. As of this writing, this self-contained electric kettle is in stock at ALARD, in EXCELLENT operational, electrical, mechanical and cosmetic condition; available for immediate shipment. 26 inch diameter by 22 inch deep hemispherical bottom vessel, with a 1.25 inch front bottom outlet and manual draw off valve. Steam jacket manufacturer tagged for 30 psi, "U" stamped, National Board coded & NSF tagged, with self-contained / integral electric heater powered by 230 volt 3 phase electrical input, complete with precise thermostatic control. 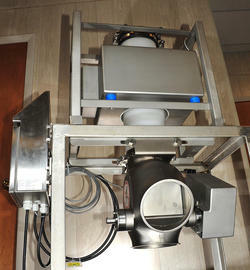 36 inch infeed height, 11.5 inch discharge height. 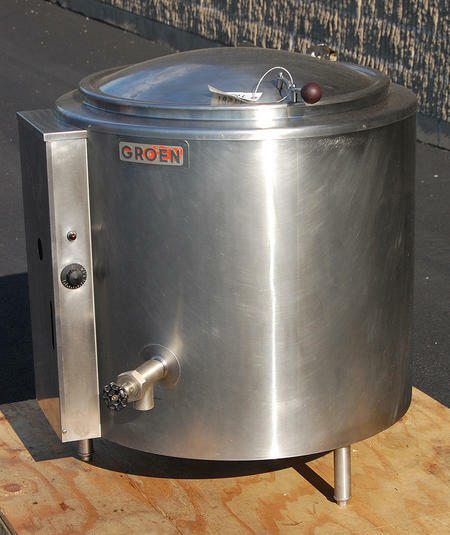 As of this writing, this Groen 40 gallon electric kettle is in stock at ALARD in EXCELLENT operational, electrical, mechanical & cosmetic condition...ready to go and available for immediate shipment. 24 inches wide by 72 inches (6 feet) long conveyor belt. White food grade rubberized belt (dirty in pictures but since cleaned and in VERY good usable condition). 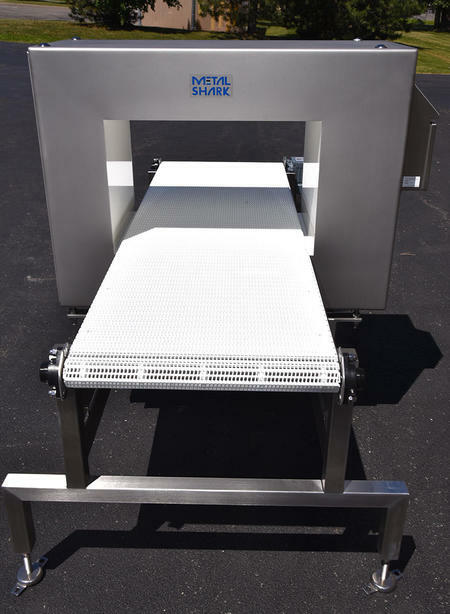 The conveyor belt runs between 2.5 inch high stainless steel sides. Portable, comes on a tubular stainless steel legs, with locking 3 inch casters, set at a 71 inch high infeed height, with 62 inch high discharge, as configured. 208/230 volt 3 phase drive. As of this writing, this Bigtem conveyor belt is in stock at ALARD, in EXCELLENT condition, available for immediate shipment. 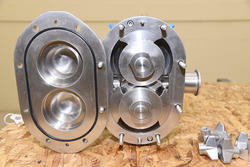 1.5 inch inlet and discharge ports with sanitary Tri-clamp connections in a horizontal flow orientation. Jacketed pump head with 1/4" threaded cooling media inlet-outlet, e.g. for water cooled operation. Manufacturer rated nominal capacity of up to 36 gallons per minute throughput (depending on product viscosity and head pressure), and up 200psi maximum working pressure. Food grade sanitary stainless steel pump. Easily disassembled for cleaning and sanitation. 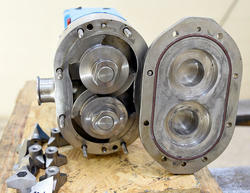 Reconditioned pump with new lobes, seals, rotors & etc. As of this writing, this 1.5 inch sanitary PD pump is in stock at ALARD, in EXCELLENT operational, mechanical, and cosmetic condition, available for immediate shipment. 12.5 inch high by 13.5 inch wide net USEABLE aperture opening with the conveyor belt in place. ingle control board technology with all control electronics on one circuitboard maximizes reliability, and minimizes maintenance expenses. 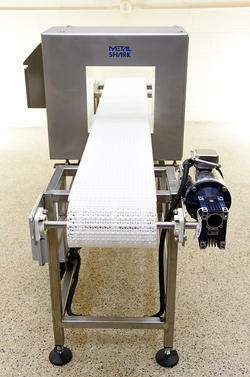 The thru-conveyor is complete with a belt-stop alarm reject system configuration, and a VFD variable speed control for the belt drive, adjustable from 16 to 75 feet per minute (approximately 5 to 23 meters per minute) belt speed. We can configure other reject systems to suit your particular product needs; CALL 315-589-4511 to discuss your specific product application. 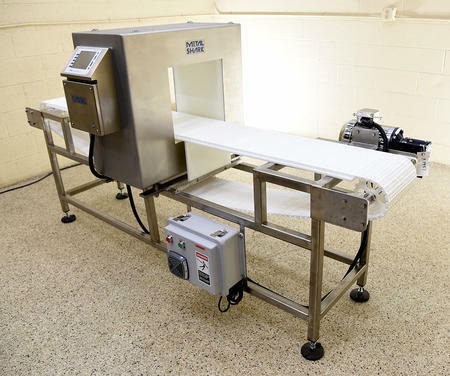 A food grade metal detector specifically built for food processing and other industrial production line and packaging line metal detection applications. All food grade / USDA sanitary hose-wash-down stainless steel construction (IP-67/NEMA 6 search head enclosure, IP-65/Nema4,4x,6,12 & 13 control enclosure). 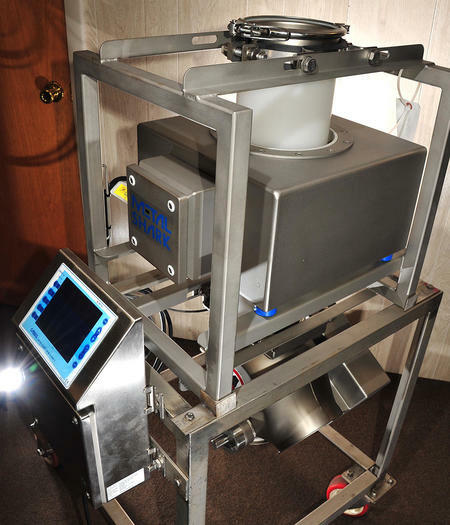 FOUR FREQUENCY LEVELS (35kHz, 75kHz, 150kHz, and 300kHz), allowing precise tuning for optimal sensitivity across an exceptionally wide range of products / product types (wet, dry, salty, meat, fruits, vegetables, fresh, frozen, hot, cold, etc.) allowing for maximum versatility with the widest range of products. The optimal frequencies automatically set by the system in "product learn" mode to maximize sensitivity / minimize false rejects with your specific product. Sensitivity varies depending on product run, and frequency setting (determined by product characteristics), especially where wet, salty, or acidic products that are electrically conductive introduce "product effect" into the equation, however the manufacturer rates dry sensitivity for this head, with no product effect at a sensitivity of 1.7mm ferrous, 2.3mm non ferrous, and 2.7mm stainless steel at 300 kHz. As of this writing, this conveyorized METAL DETECTOR is in stock NEW at Alard, available for immediate shipment. 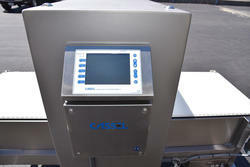 CALL 315-589-4511 to confirm availability, and to discuss your particular food process metal detection equipment needs.